I’m sure you all know of someone having this experience … either you were personally involved in some way, or you discovered your child’s attempts. Please tell us about it! 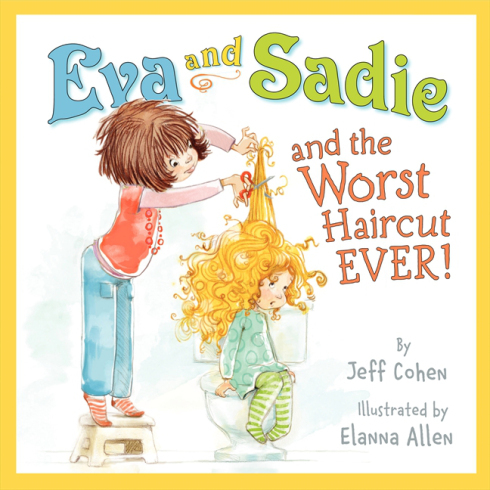 You can find Eva and Sadie and the Worst Haircut EVER! on my BUY THE BOOK! page. This entry was posted in Mostly About Reading, Reviews & Interviews and tagged Book review, children's book, Eva and Sadie and the Worst Haircut EVER!, haircut disaster, Jeff Cohen. Bookmark the permalink. Oh my. My Aunt and I tried cutting each other´s hair when we were little. t least hair grows back!! Mom was quite upset I recall. A cute idea for a book. Yes, so good it grows back.